By now you’ve seen the photos and maybe even heard the mayor of Atlanta, Kasim Reed defending himself after being called out by Al Roker after Mr. Reed attempted to blame this mess on incompetent weather people, when in fact he had been given very accurate information. I used to mock my fellow southern-city dwellers too. I didn’t know that I didn’t know until I drove home Wednesday morning pretending I was a bob sled driver. It was the only way I could stay sane while maneuvering my 1996 Camry on what looked exactly like the outdoor skating rink just after the Zamboni went for a little spin. It turns out I am awesome at bobsled driving and totally deserve a gold medal. So, if you have something snarky to say, please take it somewhere else. I’m just going to delete it anyway. I’ve been through enough and don’t feel like dealing with your ignorant and inaccurate but incredibly confident opinion that you are better at life than me. But if you are curious about what it feels like to drive 13 hours and make it 5.1 miles then I am your girl! Monday afternoon students started asking me whether or not we were coming to school on Wednesday and if we were getting out early on Tuesday. It was total OHMYGOODNESS LOOOOOK! SNOWFLAKES ON MY WEATHER APP THAT I AM CURRENTLY NOT SUPPOSED TO BE LOOKING AT BECAUSE I AM IN CLASS SNOWDAYSNOWDAYSNOWDAY pandamonium. That I quickly put the kibosh on. No, we were not getting out of school, sorry kids vocab tests are happening as scheduled. Please calm down. Tuesday morning the kids were dutifully refreshing their weather apps and “using the bathroom” (read: going down the hall to poke their little heads out the window and see if it was snowing yet.) Southern teenagers are totally adorable when it comes to snow. Meanwhile, I turn into the crankiest-yankee in town. I opened both my afternoon classes with this announcement. “I am aware that you all love snow. You need to be aware that I grew up in Ohio and moved down here to get away from this stuff. The only thing snow means to me is that it is going to take me a million hours to get back into the city. 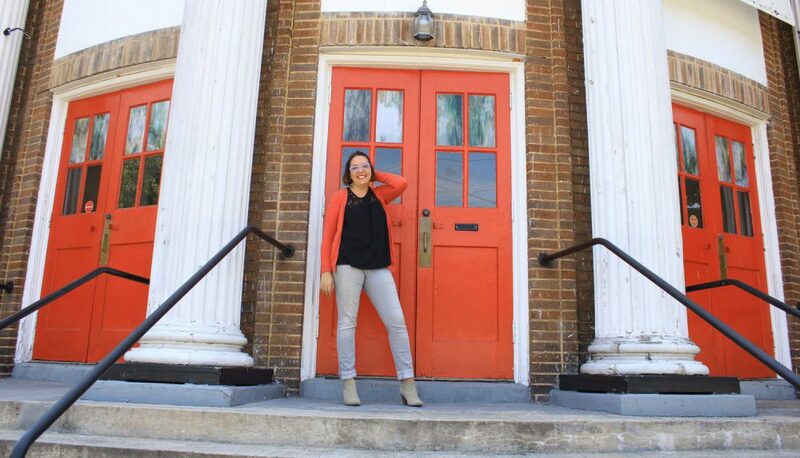 Where I live.” Then I proceeded to lock down my classroom and only let the children go to the bathroom if they swore up and down and on their mother that they had to pee and it was an emergency. Just so you know, my students are liars and brought back snowballs to prove it. Meanwhile they would not stop asking me about when school was getting out. Freshmen are adorable in that they still think that their teachers and parents have as much authority as everyone but God. We do not. Teachers, it turns out don’t get to make decisions about school closings. My class and I came to an agreement that they would stop asking me every 35 seconds if they were allowed to go home yet if I would keep the school district’s Twitter account open and continually refreshed. I thought that this deal was silly. Surely they would email the teachers before they would tweet about it. At 1:36 the school district put out a Tweet that schools were closing at 1:45. The announcement came minutes later and the kids did silent dances while I gave them the evil eye to be quiet so I could hear whether or not I was allowed to leave. 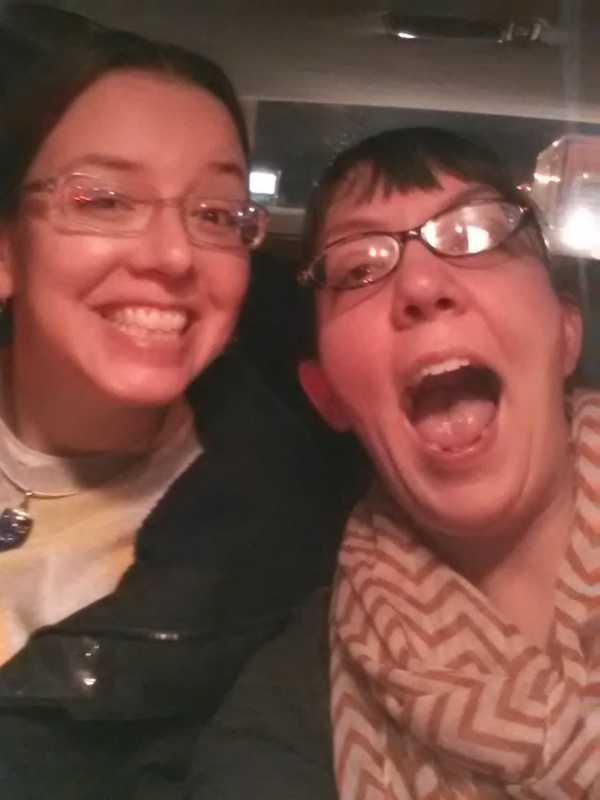 My work-wife/ car pool mate/ bff Megan and I left the school parking lot at two o’clock. It takes us 45 minutes to get to school on a good day. Due to the Atlanta Traffic you hear so much about, it usually takes us an hour and thirty minutes to get home. If traffic is terrible, it can take us as long as two hours. Three and a half hours later we had made it 3.6 miles and decided to break for dinner. We’d been staring at the Olive Garden for the last 45 minutes and unlimited bread sticks was just what the doctor ordered. We might not get home till midnight and we were going to need full bellies. The Olive Garden was closed, so we jetted (read went very slowly over the ice-covered parking lot) to the PeachTree Diner, where we were served delicious steaks at a reasonable price by a very adorable waiter named Ken who was one of only two servers working there without any busboys because no one else could make it in to work. There we were surrounded by other people also stranded. Including the guy behind us asking the price of a cup of coffee so he could figure out if he could afford to sit on his table for another thirty minutes. That’s the thing about emergencies and safety nets and having even just a smidge of margin in your life. Before you talk about how people should have just gotten a hotel room, there were a lot of people on the road who simply could not afford said (already booked anyway) hotel room. The man didn’t get charged for his coffee, I know because Megan and I had the bill transferred to us and she tacked on a giant piece of chocolate cake that the man proceeded to split with the stranger next to him and thank out loud whoever bought him his meal. It was awesome. A totally selfish move on our part as it just made us feel really really good about our evening and we needed a boost before we strapped ourselves into my car. We pulled out of the parking lot with the understanding that the first order of business was getting gas. We also pulled out of the parking lot to be greeted by the same distinct looking truck we split off from an hour and a half earlier. That was the speed of the traffic. An hour and a half to get the length of a shopping plaza. Two hours later we managed to make it a quarter of a mile down the road to the gas station. Said gas station only had premium gas. I happily filled up, peed, bought a mellow yellow and some gummy bears and headed back out again. At this point we decided we could just wait it out. If everyone else gave up and we did not we could make it home. So we wouldn’t get home until 3 in the morning. So what? My Camry has a tape player and we had this amazing mix tape from Megan’s youth that was chock full of synthesizers. I don’t know how many times we listened to the tape and I am unclear as to why but I am totally sure that Marconi plays the mamba while we built this city (we built this city) we built this city on Rock and Roll. It felt like we were trapped in one of those absurdist plays they make you watch in the intro to theatre class you slept through in college. Hours and hours pass, as do all the pedestrians who are totally lapping you on foot, and you are simply there because there isn’t anywhere else to be. There were some things we saw that warmed our hearts and gave us something to comment on. -The huskie mix who was being walked by his owner. That dog looked like he was in heaven. It was amazing. -The Bichon Frise who hopped out of his owner’s VW beetle that was parked on the sidewalk (yup, just parked on the sidewalk) that hopped out and did a few laps. -The hardworking mexican gentlemen standing outside their apartment complex pushing people up the hill. -The hardworking mexican gentlemen with a case of beer tucked under one arm and an elementary school child tucked under the other on their way home from walking to pick their kid up from school. These guys never get a day off. They were going to enjoy it. -The people walking up and down the street with bananas and water offering those things to any motorist who wanted them. People were mostly very kind and patient and there was no honking. For that I am very very grateful. There comes a point in time where you have to lose track of time in order to not lose your mind. This picture was taken 12.5 hours in. To put that into perspective, on a normal day we could have driven to Dallas in that amount of time. Instead, we hadn’t yet made it out of the suburb our school is in. About an hour after this photo was taken, we met a hill we could not get up. So, I am not one to brag about my driving capabilities. With my lack of spacial awareness (I regularly run into the desks in my classroom because I can’t gauge how close they are.) and my difficulty telling where my body is in relation to itself (like, I can’t tell how far my hand is from my own face) learning to drive was as humbling an experience as parenting toddlers. I just wasn’t very good at it. But I can say this with certainty. I am AWESOME at driving in the snow. But I just could not get up this stupid hill. I probably would have tried the whole night but a man properly dressed for the weather came and knocked on my window. You know when someone is telling you the truth about yourself. We headed to the Home Depot where they were serving Coffee and water and handing out anything they sold that someone could sleep on. Pillows for out-door furniture, carpet remnants, fat boards laid over upside down buckets, lawn chairs, all were being utilized for sleeping it out. 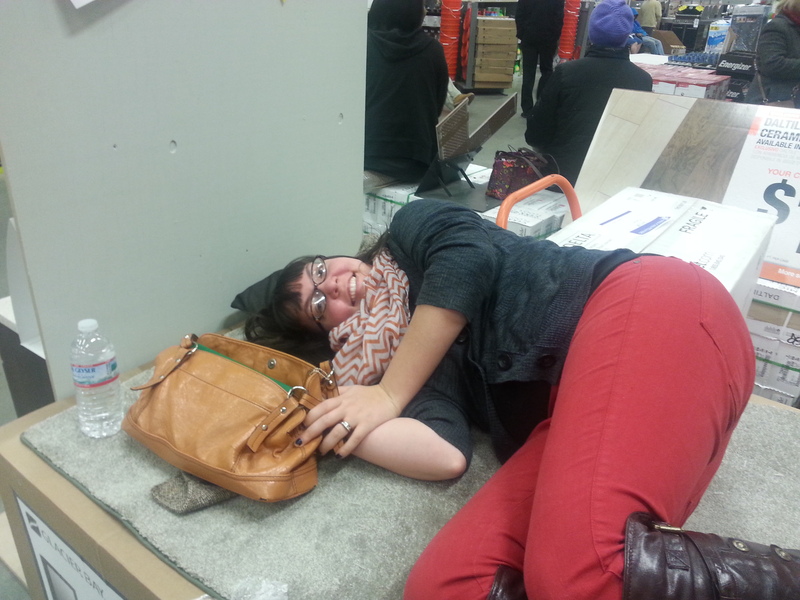 I managed to snag a prime spot on top of a row of boxes where I laid out my carpet square and slept for three hours. We called a colleague stuck in the same mess and she joined us. This is me unable to control my giggling because, seriously? 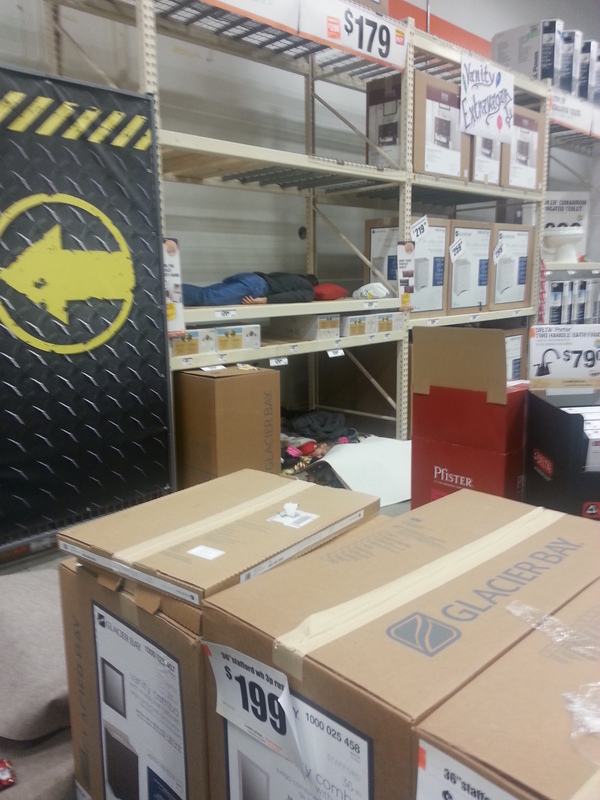 I am crashing at a Home depot? This is either hilarious or tragic and hilarious is clearly the better option. Not so hilarious were all the poor parents who were there with their kids. Megan and I jetted out pretty early and a poor mom asked for our carpets to put over her kiddos because the Home Depot was really cold. Her husband was asleep in the scaffolding above her kids in the hopes he would wake up rested and ready to drive home. At 6:30 Megan and I decided it was time to get back on the road. It took about 20 minutes to find a way out of the plaza that didn’t involve an insurmountable ice-covered hill. From there we essentially waited in a line to get up the hill that thwarted us three hours earlier. That hill almost got me again, but luckily there was an amazing team of dressed for the weather civilians who were escorting cars up the hill. One in english and one in spanish. The spanish speaking gentleman tapped on my window to advise me while the english speaking one pushed, when it became clear I couldn’t understand him, they switched, and the spanish speaking gentleman pushed while the lovely man wearing glasses, a yellow ski jacket and blue snowpants coached me “soft like a whisper” slowly up the hill. If it wouldn’t have caused me to get permanently stuck, I would have stopped the car to get your phone number. While I am married, I have lots of beautiful and single friends that I would like you to marry and make lots of gentle babies with. I told myself “soft like a whisper” the whole way home. Speaking of the whole way home. It was totally surreal. We managed to beat the crowd and most of the time we were coasting along at 15 miles an hour. It felt like we were FLYING after the parking lot pace we had been maintaining for thirteen hours the night before. It also felt like what my middle school self imagined being left behind post rapture would feel like. I couldn’t even make any Walking Dead jokes, because Megan has an irrational fear of zombies. But I could pretend I was bobsledding. Which I seriously did, the whole way. I pretended I was in a low-speed bobsled. It was obvious from the feel of the tires under my foot on the gas, that there was exactly zero traction and we weaved through abandoned cars and ran red lights because there was no one on the road anyway and I was afraid that hitting the brakes would cause uncontrollable spinning out on my part. We busted through the doors at Megan’s house at about 9:30 like a couple of football players who had just won the big game. Seriously telling her wife Mindy how awesome we were and refusing to take a nap because we were just too hyped because WE ARE AMAZING AND CAN CONQUER THE WORLD!!! An hour, lunch, and a shared bottle of wine later Mindy found us both drooling on ourselves on their couch. By the time I was ready to think about getting back in the car it was getting dark, and frankly I still wasn’t ready. After all the laughing and back patting, it slowly dawned on me that I was very very lucky something bad hadn’t happened to me. The cars were abandoned all over the road not because people were scared of a little snow, but because that was their very best option. If you are stuck in a snowstorm in the north, you just have to wait for the plows. The plows weren’t coming. We don’t really have any. Strangely, the perfectly safe drive this morning to get from Megan’s house to mine was the most traumatic. Every curve and semi icy spot caused me to cringe and hit the brakes, every other car was definitely on its way to hit me. But then I got home. And was greeted by this. I understand that the rest of the country thinks it is crazy that all the schools are closed tomorrow. I am just grateful for a little bit more time before I have to get in my car again. a) I think by lamest you mean most epic. b) As a fellow southerner, I would like to take this moment to tell all the snow snobs that THIS is the reason southern towns shut town for a seemingly small amount of snow. We are simply not equipped to deal with it. It just doesn’t make economic sense to have the same resources as a northern city would to deal with weather that we rarely see. It makes far more sense to just shut things down for the day. Especially considering bus drivers with CHILDREN are not accustomed to driving in this type of weather. It was even a disaster at my husband’s district farther north in a smaller city. Of course, things should never be this crazy, but anyone who’s ever had to drive through Atlanta is probably not terribly surprised. Rant over. Sorrynotsorry. Glad you’re safe friend! You totally deserve that extra day to catch up! Yeah, the bus drivers were total champs. And trust me. totally lamest. The Home Depot photos, especially, are amazing. It was totally surreal. I would have taken more photos but was sticking to the old 10 and 2. Abby, you are a fantastic storyteller. I laughed through this entire thing (not *at* you, *with* you, I hope you understand. 😉 ) So glad you made it home safe. Thanks! Quite a compliment from you. We could either laugh or cry, let the hilarity ensue. I am so glad you had someone to share your journey with you. I left Rowell High School at 1:15pm on Tuesday afternoon and finally got home to Norcross at about noon the next day. I too have earned a gold medal in bobsledding a car. Thank you for your view of the situation, i too am glad to be home. Make sure to rest tomorrow. We deserve it! Dear Abby… I could hear you the entire way through this blog. You are amazing and strong. So proud to have Megan in your care when she can’t be in mine. Could not have mad it without her. You don’t know me (yet) but I know Mindy and this is my favorite post about the epic drive home I have yet seen. I’m glad that you and Megan had each other and made your own fun. I might have lost it laughing at the photo of you in the Home Depot, we should be friends, we’d have many hijinks with Megan and Mindy. This is some hilaritragic stuff right here. Rock on. And I skipped the part where I (the old HS band nerd) tried to teach Megan how to play the air synthesizer with the greater accuracy. Wahahaha. Can’t wait to meet you! I think that moment may need to be recreated on video. For posterity. So future generations can truly understand the trials of SnowJam2014. Megan air keyboards the wrong notes every time! She is trying to teach herself German right now. But, I feel like air instrument instruction would be more useful. I mean, if you can bust it out for some Jefferson Starship, what kind of co-pilot are you? Katey and Abby… definitely meeting must occur. If stars align for Katey, maybe at the book launch. Glad you made it home safely! 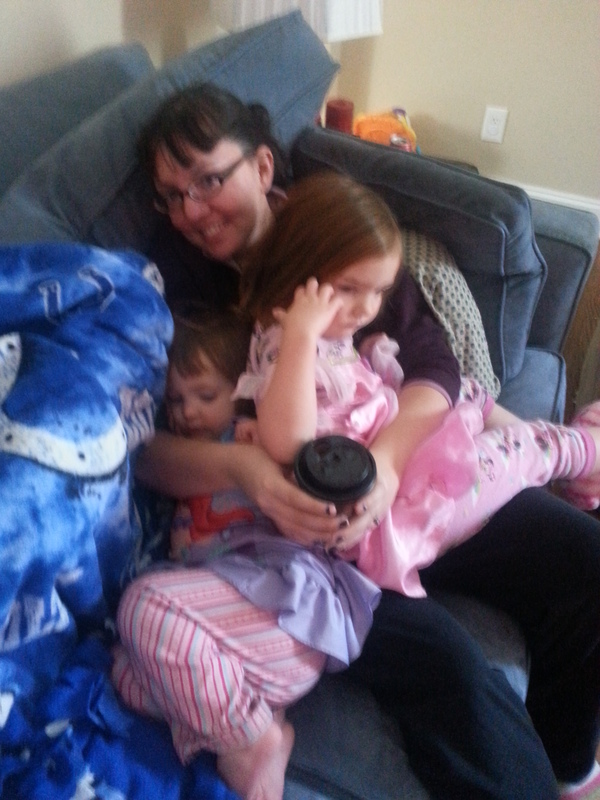 A snow day in the south is a fun pause when you get to stay in your house, but not so much otherwise. Nice to hear about so many kindnesses and the everyday heroes. My sister (Emily Kofoed) shared this on Facebook. First I have to say I am so glad you are okay! This was one of the craziest things I have read in a long time. I keep hearing about all this on the news but this is by far my favorite first hand account I’ve read yet. Your sister is the greatest (but you already knew that) and the whole thing…well I am still having trouble believing it. Abby, this was so interesting!! When I read Christian’s comment that you were stuck 16.5 hours on the road I couldn’t imagine how anyone could handle that. Bathroom is all that went through my mind. So much more awesome an adventure, so glad you’re safe & sound!!!!! Not as glad as I am! I am about to hit the bathtub with a bottle of wine. I think I have earned it. oh my word girl. Somehow I managed to avoid all of the driving during the snowpocalypse . . . which is lovely, except we’ve been stuck in the house with approximately all-of-the-neighborhood-children all week. AND no school tomorrow! 🙂 sigh. You guys are ROCK STARS. Good grief, i would have been in a puddle somewhere, freezing to death. And that puddle would have been composed of my hysterical tears! Amazing story, Abby. And amazing storytelling, too. Wowza. Oh wow. Girl, I am so glad you are at home safely. That sounded like a bit of a nightmare! And that makes me feel a lot better about Britain. Whenever we have snow we end up looking like hysterical pansies, because the whole country grinds to a halt. But that’s because we don’t have snow plows, and only enough grit on the roads for a small storm. So I could def relate to your situation. And ‘soft like a whisper’ just about slayed me. You have writing-magic. Like special superpowers. Seriously. Sleep well, amazing lady – and that pic at the end was gorgeous. P.s. Also really loved that article you pointed to by Rebecca Burns about the reason why it all happened – really interesting to know how Atlanta is made up. ‘Soft like a whisper’ SLEIGHED me. BOOM BOOM!! Thanks for sharing your eyewitness account!! CRAZY. Glad you survived. 2. I’ve always said that the best stories happen to those who tell them. (I say these after horrible, or absurd things happen) This story = awesome. I’ll be thinking about this for a long time. So many pieces. It was poignant, funny and horrifying. God was with you – no bumping into anything, food and shelter and gasoline. Guys to coach and push you up the hill. Glad you had another day off.